I bought this press when I was doing large hand-printed woodblocks. Now that I’m an established letterpress printer, I don’t use the etching press any more. 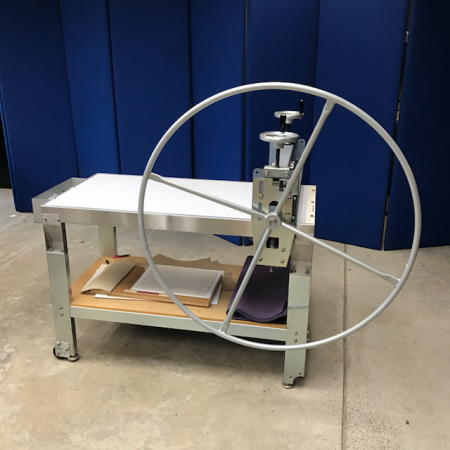 This press is different than other etching presses - the rollers move instead of the bed so it doesn’t require extra floor space for a moving bed. It also has wheels on one end so it can be moved by one person. Put it right up against the wall to save even more space. Asking: $3000, local pick-up. If you pay the travel costs, I can deliver it within an hour or two of Santa Fe.